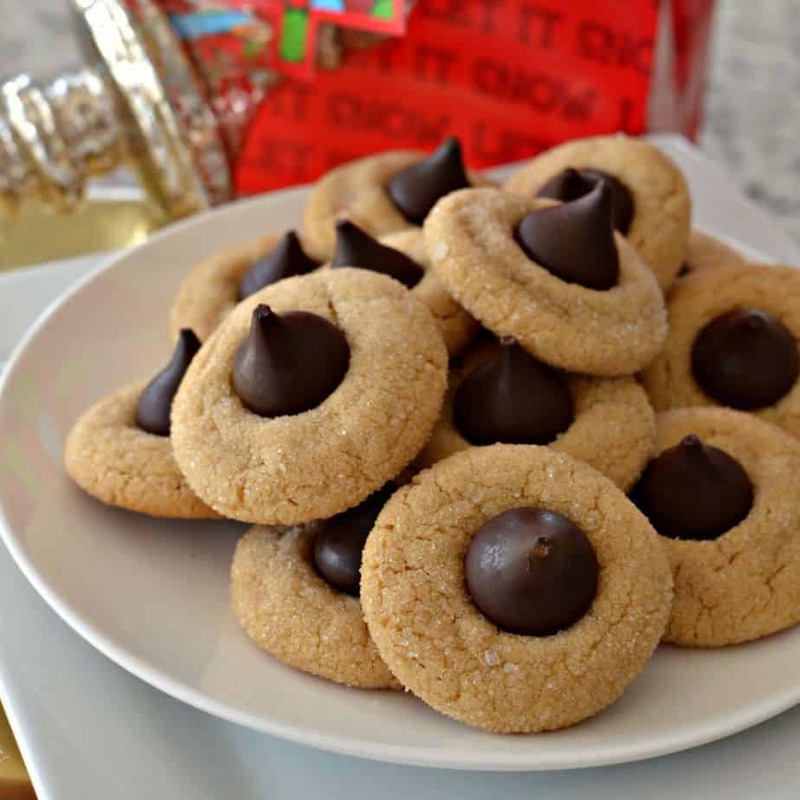 These classic Peanut Butter Blossom Cookies are one of my most popular Christmas cookies ever. These delectable cuties are slightly chewy, packed full of extra peanut butter flavor and topped with a dark chocolate kiss. These cookies along with my Buttery Pecan Snowball Cookies and Peppermint Chocolate Thumbprint Cookies make such an awesome holiday presentation. Have you started planning your Christmas cookie trays? If not you had better hurry. Christmas is just a few weeks away. These scrumptious Peanut Butter Blossom Cookies are a must make for all my cookie loving friends and neighbors. They are easy, quick to come together and the ultimate loved classic Christmas cookie. 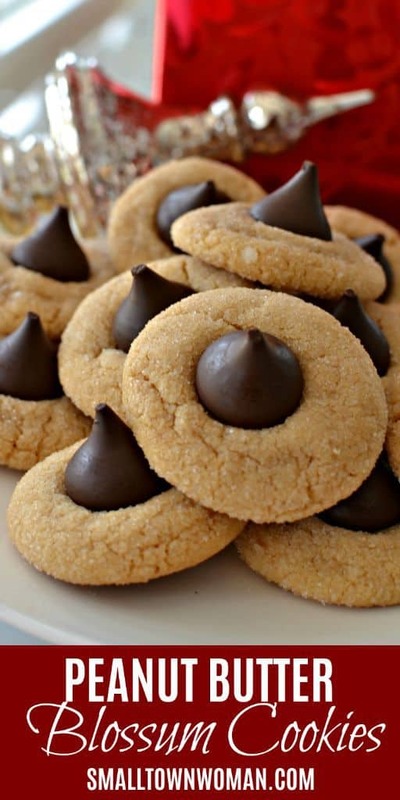 How do you make Peanut Butter Blossom Cookies Recipe. First in a medium bowl combine your flour, baking soda, baking powder and salt. Then cream your butter, sugars and peanut butter until light and fluffy. Add the egg and the vanilla to the butter mixture and mix just until incorporated. Slowly add the flour mixture to the butter mixture stirring after each addition. If using a mixer don’t forget to scrap the beater and the bowl. Then refrigerate the dough for a couple of hours. Roll the dough into about three quarter to one inch balls. Roll the balls in granulated sugar and place on cookies sheets lined with silicone mats or parchment paper. Bake until very lightly browned. When you remove the cookies from the oven top with a chilled kiss. I usually pause for about one minute and then I gently press it into the center of the cookie ever so slightly. Let the cookies fully cool before stacking as the chocolates is soft for a little while. 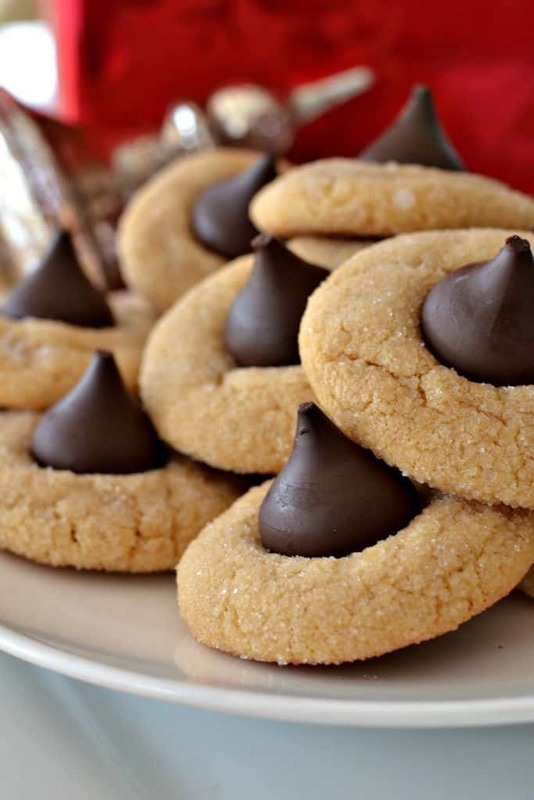 Do you have to use dark chocolate kisses on Peanut Butter Blossom Cookies? No you most certainly do not although they are my favorite. They are absolutely delicious. 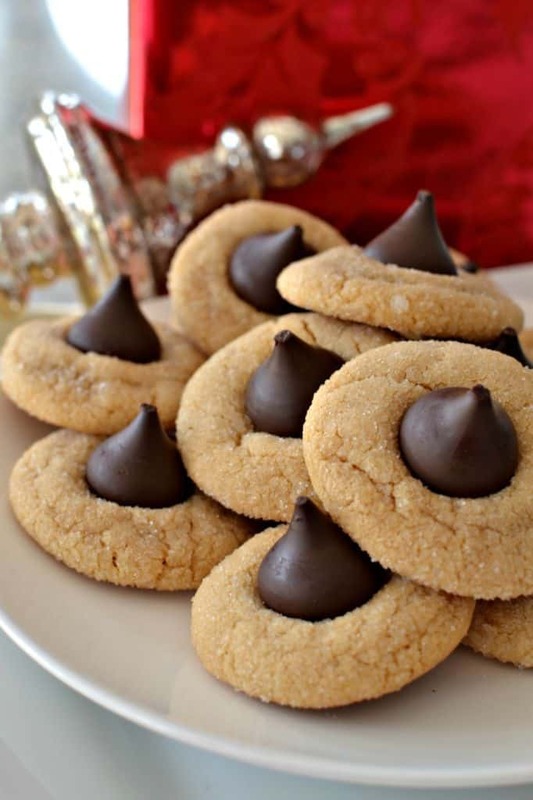 The traditional kiss for these cookies has always been the milk chocolate kiss. Other fun kisses to try would be the hugs, hot cocoa and even the caramel kisses. Have fun with it! After all it is almost Christmas! Why you should always run a cookie practice run. I always advise people to cook one or two cookies to establish optimum baking time. There are always slight variations in the size of peoples cookies, oven temperatures and placement in the oven. Running a practice run gives you a chance to get it all correct before loading a whole sheet. In addition to that if the cookie spreads too much on the practice run you have the opportunity to chill the dough a little longer. Helpful hints to make these Peanut Butter Blossom Cookies epic. Before you start your cookies place the Hershey Kisses in the freezer. This helps them keep their original shape when placed on top of the hot cookies. Use creamy peanut butter for these cookies because it works so much better. These are small cookies and chunks of peanuts just won’t work. Plan ahead as this dough needs to be refrigerated for a couple of hours. Place the cookie on the sheet about two inches apart. They don’t rise or spread a whole lot but the hot oven air needs to able to flow between the cookies. Unwrap your chocolate kisses right before your cookies are done. That way you will be ready to go. I pause for about one minute before I put the chocolates on. I am usually unwrapping the last few kisses. These cookies must cool completely before being stacked because the chocolate kiss gets quite soft. It will harden again but it can take several hours. These cookies can be frozen for four to six weeks. I don’t like to go much further than that because of the chocolate. Simply double wrap in freezer bags and place in a sturdy container. The dough can be double wrapped and frozen for two months. Store baked cookies in an airtight container for up to one week. These delectable Peanut Butter Blossom Cookies are simple to make, picture perfect and loved by generations. Put the ingredients on your shopping list today and wow your family and friends for the holiday. Merry Christmas everyone! I hope you have any absolutely fabulous holiday. 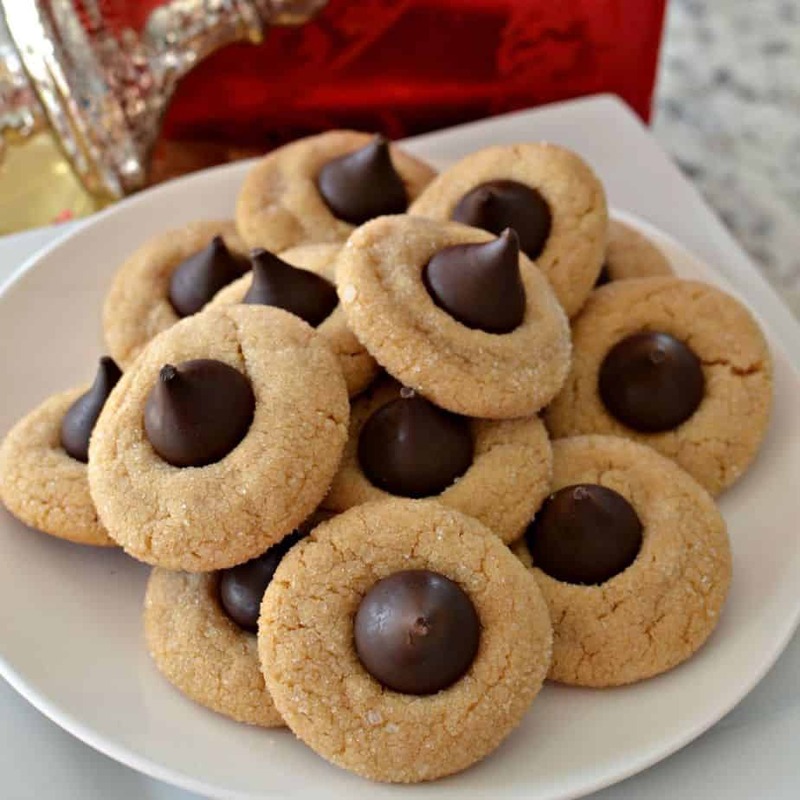 These classic Peanut Butter Blossom Cookies are one of my most popular Christmas cookies ever. These delectable cuties are slightly chewy, packed full of extra peanut butter flavor and topped with a dark chocolate kiss. Place your wrapped chocolate kisses in the freezer. Preheat oven to 350 degrees. Cover baking sheets with silicone mats or parchment paper. In a medium bowl combine your flour, baking soda, baking powder and salt. Cream butter, 1/2 cup sugar, brown sugar and peanut butter until light and fluffy. Stir in egg and vanilla extract; just until incorporated. Slowly add the flour mixture to the butter mixture; stirring after each addition. Cover and refrigerate the dough for 2 hours. Place 1/4 cup sugar in small bowl. Roll the dough into 3/4 to 1 inch balls. Roll the balls in granulated sugar and place on the baking sheet about 2 inches apart. Bake for 8-10 minutes or until very lightly browned. Remove cookies from the oven. After 1 minute place 1 unwrapped chocolate kiss in the center of each cookie pressing down gently and ever so slightly. Remove cookies to cookie cooling racks and allow to fully cool. Store in an airtight container for up to a week. My family loves these cookies! 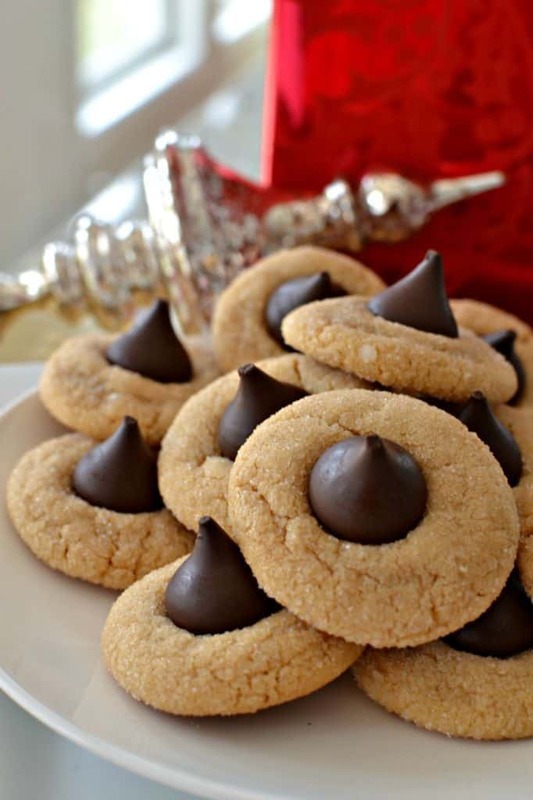 Christmas baking at our home wouldn’t be complete without the peanut butter kiss cookies. Love your site. Same here! Have a very Merry Christmas Ricky and enjoy your baking! Why do you refrigerate your dough before baking? The butter gets worked over and it needs to thicken a bit so they do not spread too fast in the oven. You can always run a test run with one to two cookies to establish if the dough needs refrigeration.